According to the Content Marketing Institute, webinars can be extremely beneficial to small businesses. Many marketers are well aware of this fact: 79% of companies use webinars for lead generation and 70% of marketers believe webinars are effective. Webinars are also extremely helpful as an alternative to live events, such as conferences. They can reduce the cost of such events by up to 80%. The advantages webinars offer are, in fact, numerous. Shrewd entrepreneurs will use them to bring value to their clients, employees and, ultimately, themselves. One of the most obvious merits of a webinar is that it brings exposure to your brand and builds your reputation. And because all they require is a device with online access, webinars have the added benefit of providing you with access to people throughout the world. Remember, though, that your main focus with your webinars should be to serve your customers, meaning that the content you offer needs to be helpful and educational. If you concentrate mainly on promoting your product or service, you will appear to be self-centered and will turn people off. While all companies need to sell in order to survive, it’s important that your posture is one of wanting to help your audience. Webinars can be a great way of humanizing your brand. They provide a unique opportunity for you to interact and engage with your customers. You can give them valuable information and directly answer any questions they have. This both helps individuals in the moment and helps you to better understand, serve, and sell to your target audience in the future. A webinar solution such as Clickmeeting is one of an example of software that enables you to effectively engage with your audience. You can present content through a variety of means, including video, charts, PowerPoint, and screen sharing. Having diverse methods of communication lets the facilitator present complicated information successfully. By strategically offering engaging content to your clients, you will establish yourself as an authority and expert in your field. Another way to establish your authority is by collaborating with other experts in your field. Doing so will benefit both the influencers and yourself, all the while enriching the experience for your audience. Do note that you can use webinars to market a product, so long as the product serves the education and value you’re providing to the audience. Also, if what you’re talking about is a hot enough commodity, you can even charge a fee for people to attend the webinar. 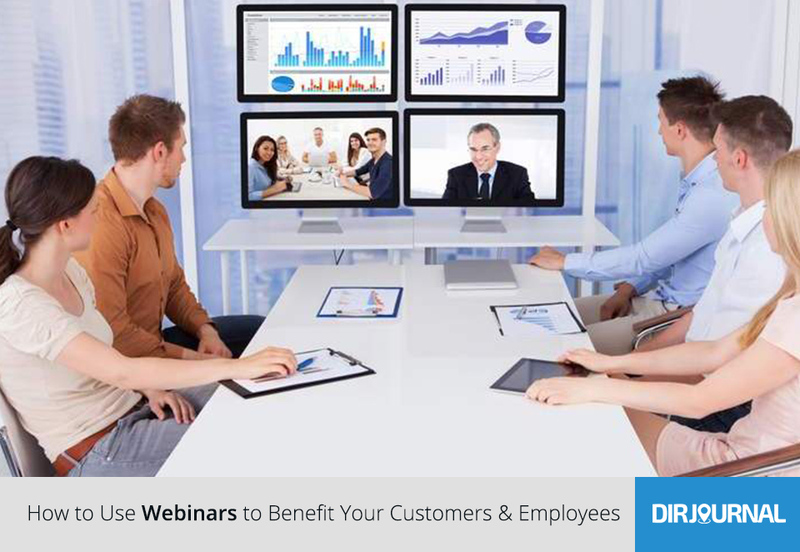 In addition to benefiting your business, webinars can be a useful tool for benefiting your employees. Harvard Business Review contributor Keith Ferrazzi notes that it is all too easy for companies to neglect their staff. In the global workforce, people often work remotely. It’s easy for onsite staff to forget about those who are working offsite. Virtual solutions are a prime resource for this type of situation. Another important point to note is that technology now updates so quickly that workplace training needs to keep pace with the latest developments. Companies face the challenge of making sure training happens on a continuous basis while not swamping their employees with information. Webinars are a convenient option for providing such training. Even if your goal is to train all your staff who are onsite, webinars can still be helpful. For example, if people have to miss an in-person session for some reason, then they’ve likely missed it for good. But if you do your training through a webinar, your employees can participate anywhere they have internet access. And they can easily watch a recording later if they had to miss the training entirely. Another benefit is that if certain employees didn’t grasp a concept or remember something important the facilitator said, they can re-watch the webinar. As a result, webinars can help people to retain information better than they would have been able to otherwise. It’s also helpful that webinars provide a way for employees to ask questions in a low-pressure environment, i.e., anonymously. As an entrepreneur, hopefully it is true that you want to serve everyone in your sphere of influence, whether your customers or your employees. If you have not yet done so, consider how webinars can help you meet that goal. This strategy will not only benefit those around you, but in the end, it will also benefit your company.